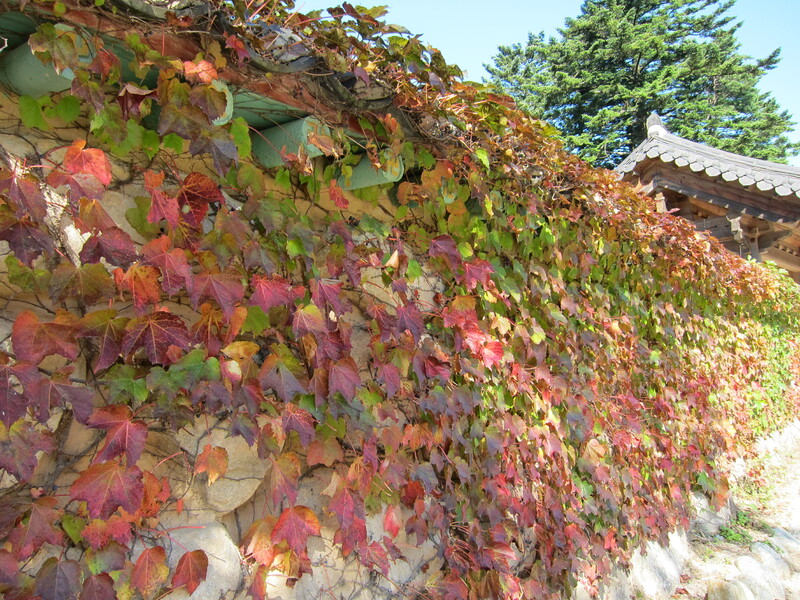 Vines covering the wall of a Buddhist temple near the start of the trail. 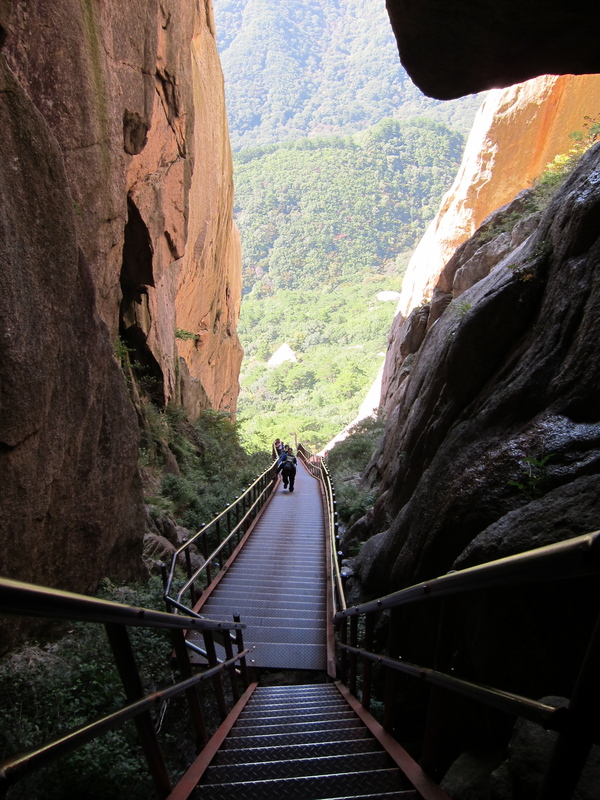 The way to Ulsan Bawi, the craggy northern face of Seorak Mountain, is always vivid with color. In early October, the leaves hadn’t really started to change color, but Korean hikers like to wear lots of bright orange and red. Even pink is not a color reserved for women. I love the way Koreans love the mountains. 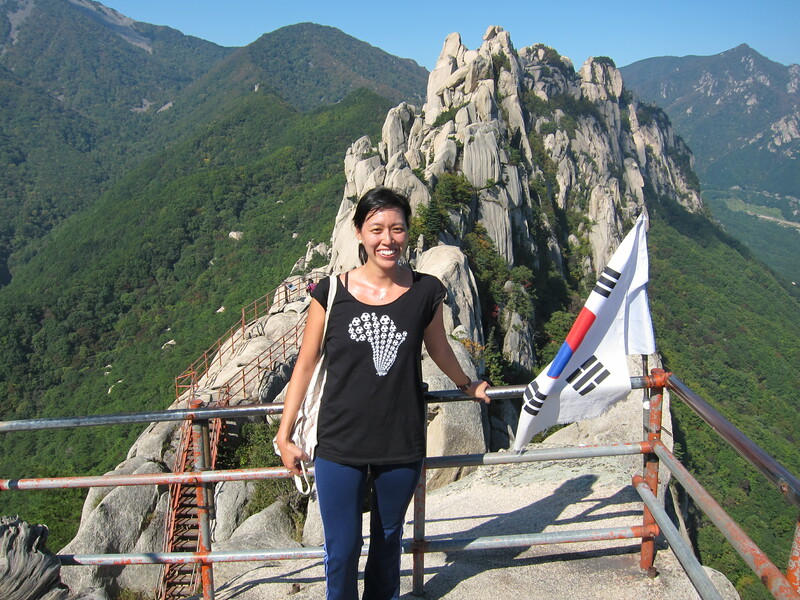 Despite a longstanding belief in the qi or power of mountains, Korean appreciation for mountains is not spiritual, at least not in the Western, ethereal sense. 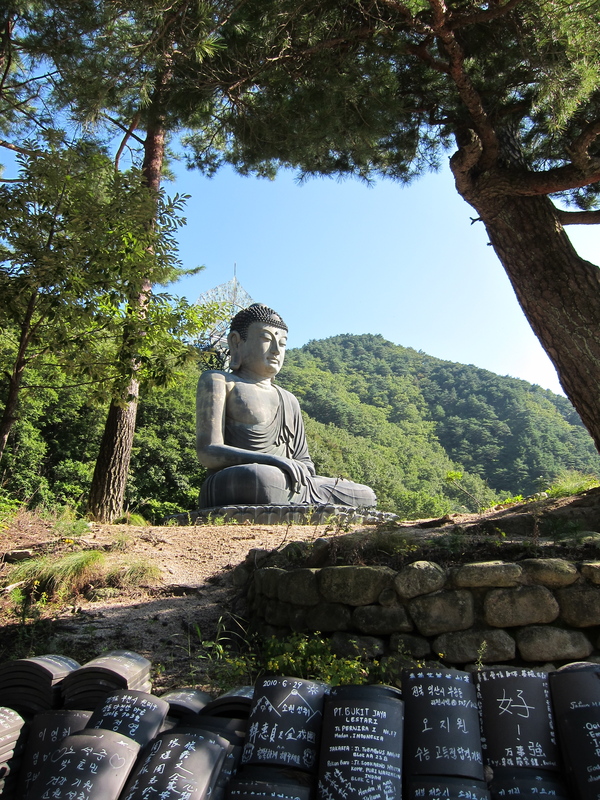 There is certainly a tradition of asceticism, of solitude and silence among Buddhist monks, and there are several temples on the way to Ulsan Bawi, but the boisterous majority enjoy the mountains the way Koreans enjoy most things, with all their bodies and all their might. 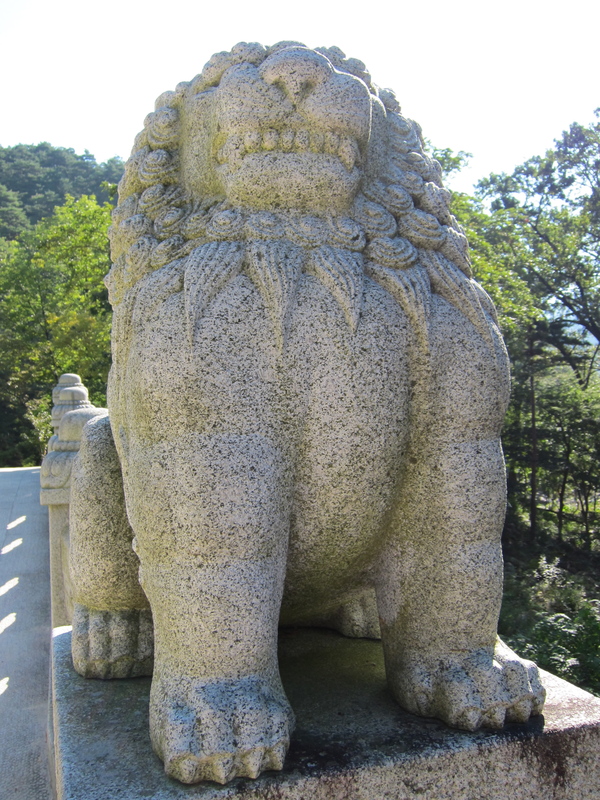 Guarding the bridge at the start of the trail. I walked alone, having left my parents to putter around the base, but everyone else walked in packs, at least three if not six or more. It’s a relatively short hike, about 6 kilometers (or 3.7 miles) round-trip, but nearly everyone was outfitted with hiking boots, backpacks, walking sticks, and hats, golf caps for men and visors for women. The visors came in all colors and materials. I was dying to ask the woman sporting one bedazzled in silver sequins where she had bought it. 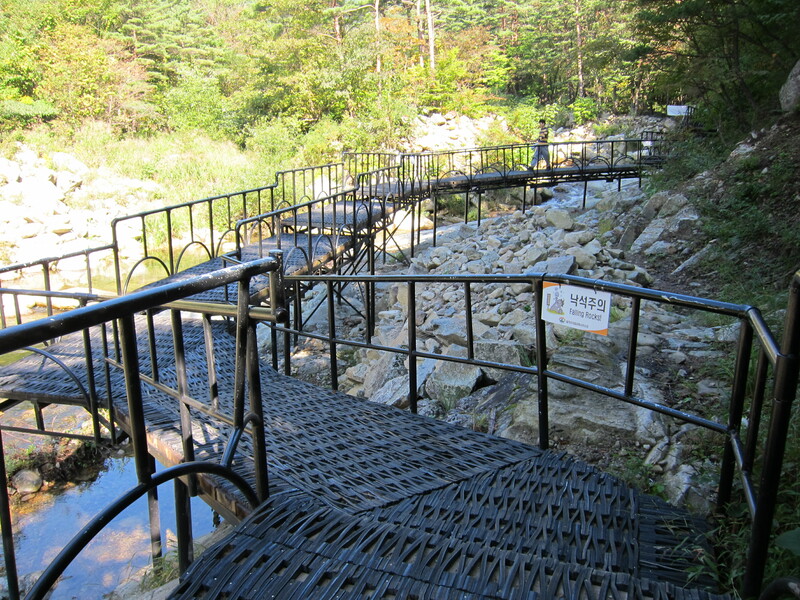 Although the trail to Ulsan Bawi ends in a vertiginous staircase, the vast majority of hikers were middle-aged and older. I’d say a good 50% were over 50. They climbed slowly but with fervor. We are not a lazy people. I passed three middle-aged women talking about how there are so many places to go—Tibet, Nepal! Luckily, most of the way the trail was broad and accessible. The trail starts on a wide paved road following a rocky stream, which leads to metal walkways paved with springy tire scraps. On the way, there were two ahjummas selling homemade pumpkin candy, who called out, “Try some yeot, only 500 won!” in between texting on their cellphones. Further up was a rest stop, by which I mean more than a couple of benches and pit toilets. This rest stop had three or four restaurants selling Korean favorites, like mixed rice bowls and spicy rice cakes, as well as cold sodas and Buddhist prayer beads. The owners stood outside as we streamed by, reminding us, “Be sure to have a cup of makgeolli rice wine on your way down!” In case you regretted not stopping at this rest stop, there was another one a kilometer or so up the trail. But most of the hikers on the trail were carrying plenty of their own food. As the climb got steeper, they peeled off in little groups. Under the shade of pine trees, they laid out their spread. No sandwiches or granola bars for them—they were carrying full dosirak lunches of rice with plenty of banchan, small, salty side dishes that taste even better in the mountain air, judging by the happy looks on their faces. 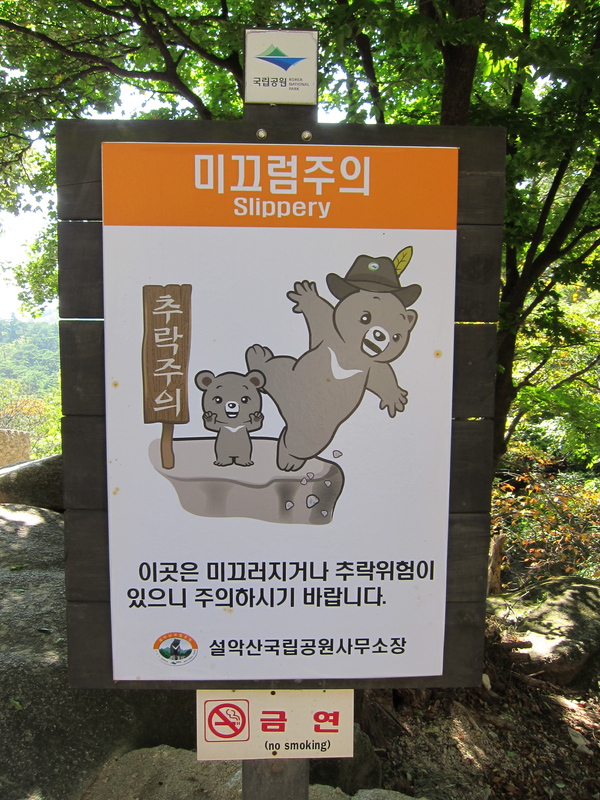 I think all national parks should have adorable bear mascots. I hope when I am 70, I am still climbing stairs like this. It somehow helped that the stairs had been painted a dull orange—it made it easier to keep putting one foot in front of the other. 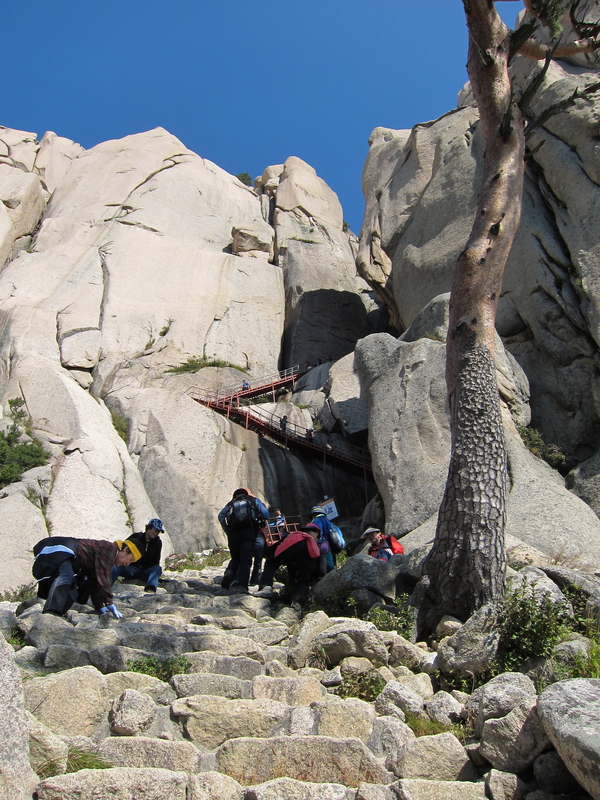 The stair case made a few turns, there was a tight squeeze through some rocks, and then one last short climb which led to a small flat rock looking out at Ulsan Bawi. I didn't bring any hiking clothes or equipment to Korea. Oh well. The rock is small, only 100 square feet or so, so we all sat squeezed together, resting our exhausted thighs and marveling at the view. There was a tattered taegukki or Korean flag on the rail, which people posed next to proudly. Part of the makeshift deck was taken up by a vendor, who had somehow lugged a desk, a small boombox, medals, drinks, and a photo-taking kit up here, though how he managed to get up the staircase with all that crap, I could not imagine. He didn’t do much of a hard sell, though; he stuck to quietly selling cups of instant hot coffee to people who asked. All the chatter, the plastic tarps at the rest stops, the hot coffee vendor at the top, none of it took away from the beauty of Seorak Mountain. Despite the eating, there was no trash. The stream ran clear and cold. The bare boulders shone white against the green tree tops, and I wished I could come back when they would shine even brighter against orange, red, and gold. My father said, “Doesn’t it look like Yosemite?” I couldn’t agree—it doesn’t have the majesty of remoteness and danger. As hard as the climb is, I imagine it can’t compare to Half Dome. But I loved that these mountains felt familiar, tough but accessible, even to the grandmothers who clawed their way up there. 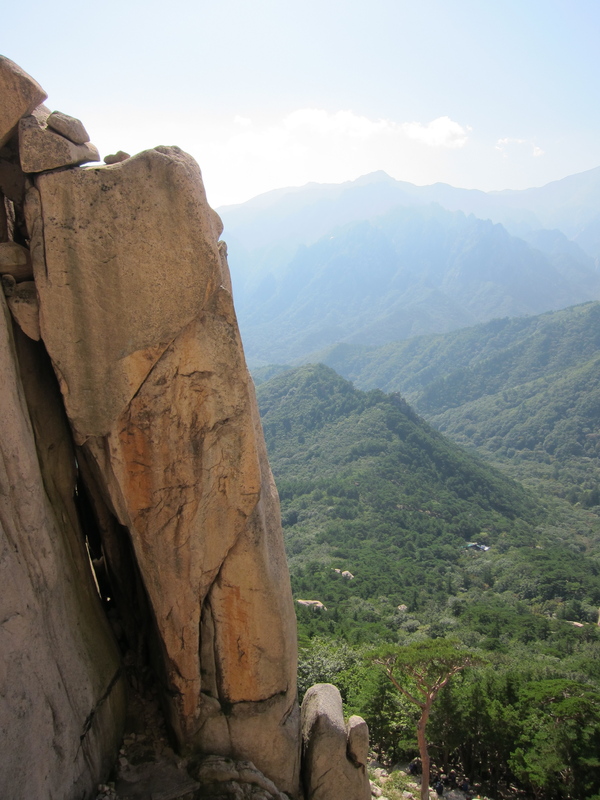 The legend of Ulsan Bawi is this: the Creator of heaven and earth sent out a call to all the boulders and rocks to come create the most beautiful mountain in the world, Geumgansan, which is now in North Korea. Ulsan Bawi tried to go, but its enormous mass kept it from getting there in time. On the way back, it stopped in the mountains of Seorak, saw how beautiful it was, and decided to stay. 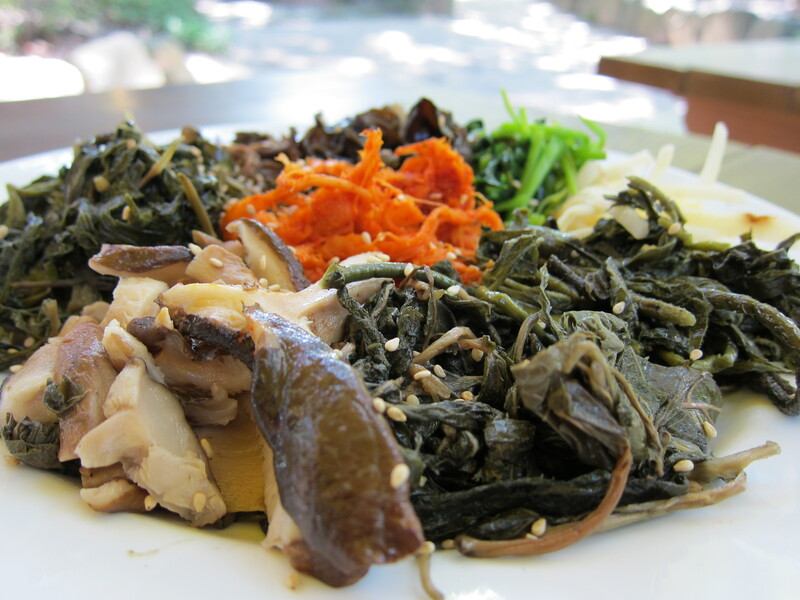 The best thing to eat after a climb -- sanchae bibimbap, a mixed rice bowl with wild herbs and vegetables. In Korea, even the mountains love mountains. 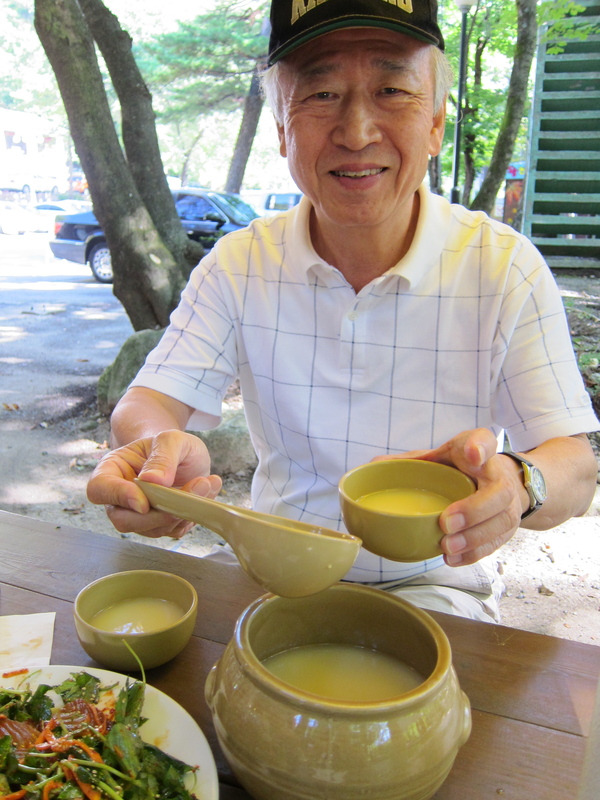 And the best thing to drink -- makgeolli, a lightly fizzy rice wine.